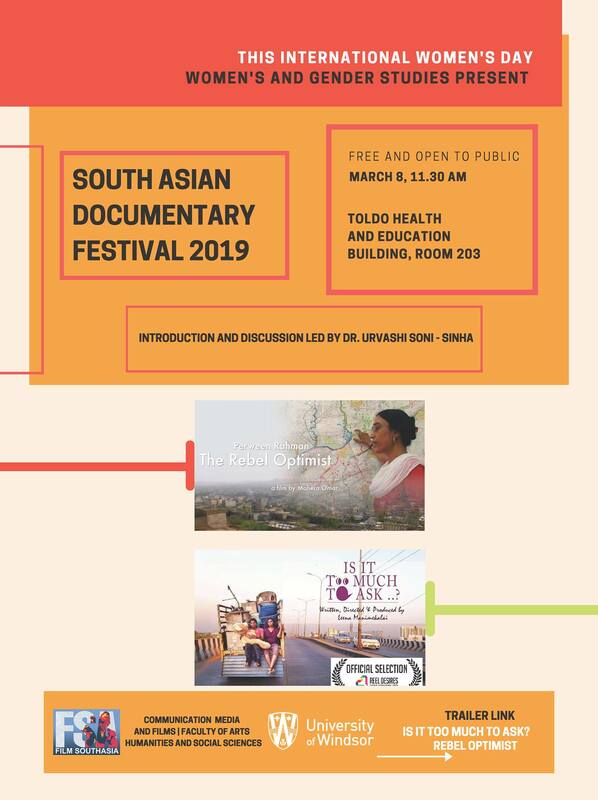 Women’s and Gender Studies presents two films as part of the South Asian Documentary Film Festival 2019 to celebrate International Women’s Day. Join us on Friday, March 8 at 11:30am-1:30pm in Toldo Health Education Centre, room 203. A film that follows the journey of two friends in Chennai and the obstacles and social stigma they encounter in not just looking for a home but being single and the fact that they are transgender women. Discussion of the films will be facilitated by Dr. Urvashi Soni-Sinha. Refreshments provided, all are welcome. These films are part of the Travelling Film South Asia documentary film series. The South Asian Documentary Film Festival will be showing films from this series on March 8, 9, 14, 15, & 16 in Windsor.